Viet Fun Travel has offered Vietnam Trip 7 Days 6 Nights at affordable cost to explore the unique beauty of Vietnam. 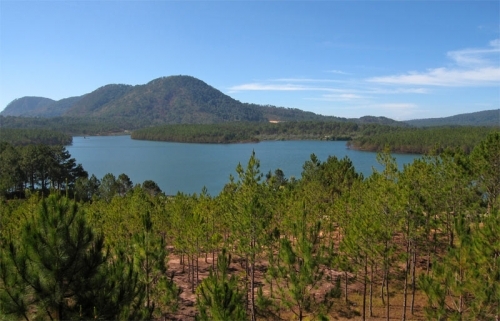 You will have a good chance to visit many beautiful landscapes in Dalat and an underground tunnels network constructed by Vietnamese fighters during the struggle for independence in Cu Chi Tunnels. Moreover, you explore bustling Sai Gon City with the unique and excellent French architecture in Notre Dame Cathedral, General Post Office, Reunification Palace and Binh Tay Market. Mekong Delta Tour is a memorable trip to visit Cai Be Floating Market, coconut candy workshops, fresh fruit orchards, natural landscapes, An Binh Island and experience the daily life of local people. Let’s book this trip with Viet Fun Travel to explore Vietnam in 7 days 6 nights. Floating market + coconut candy workshop. Your driver will pick you up from international airport and transfer to hotel. Start Vietnam Trip 7 Days 6 Nights. Have a dinner on cruise. Included: Pick-up at airport & transfer to hotel, transport transfers to water puppet show & dinner cruise, water puppet ticket, dinner cruise and accommodation in Saigon. Excluded: Breakfast, lunch, tips, drinks, travel insurance and personal expenses. This morning you will take transport to Dalat from Saigon. It takes 7 hours. Have a lunch your own. 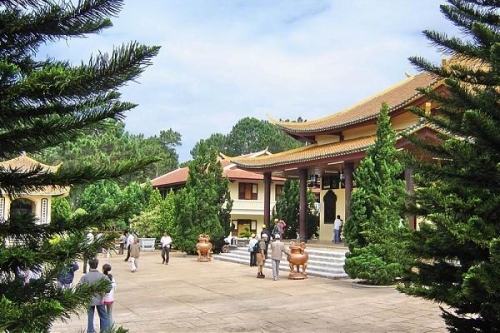 Included: Transport: Saigon - Dalat, English speaking guide (joining group tour without guide), breakfast at hotel and accommodation in Dalat. Excluded: Lunch, dinner, tips, drinks, travel insurance and personal expenses. Truc Lam Zen Meditation Center . 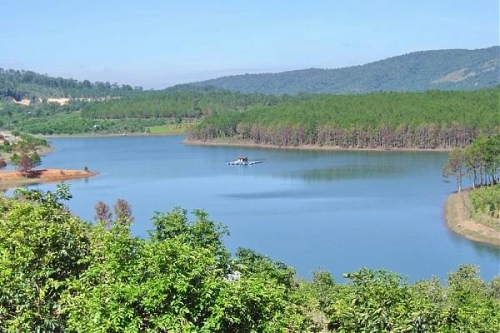 Tuyen Lam Lake – so beautiful landscapes. Included: Transport in tour, English speaking guide in tour, breakfast, lunch, 01 water bottle, entrance fees, ride elephant (joining group tour without ride elephant) and accommodation in Dalat. Excluded: Dinner, drinks, tips, travel insurance and personal expenses. Enjoy driving through Mountain View. Visit local vegetable and flower farms. Visit Coffee and Tea plantations Z try it. Special Silkworm farm and its factory. The biggest Elephant waterfalls in Dalat. Then see pagoda with big happy Buddha. Visit some local families with rice wine making, Cricket farm, tropical fruits, etc. Visit one of the traditional K’ho minority villages by walking to explore traditions. Visit Crazy House before ending Dalat Countryside 1 Day Tour. Transport transfer back Saigon and stay overninght in Saigon. Included: Transport in tour, English speaking guide in tour, breakfast, lunch, 01 water bottle/pax and accommodation in Saigon. Departure at 8.30 am. 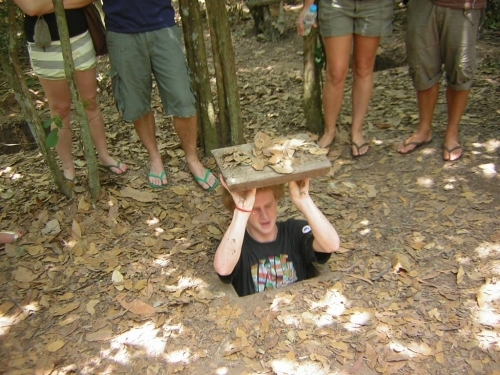 Start Cu Chi Tunnels - Saigon 1 Day Tour, excursion Cu Chi Tunnels, an underground tunnels network constructed by Vietnamese fighters during the struggle for independence. It took about 25 years to build this underground city, which has living rooms, kitchens, hospitals, weapon factories, storage facilities and command centre. The tunnel system was an excellent way for the Vietcong to move around the countryside undetected by the Americans and home to around 10,000 people who lived underground for several years. Notre Dame Cathedral: Located in the heart of the city and it was built by the French in the late 1877s. Notre Dame is not just the oldest Christian church of Vietnam but also a unique and excellent architecture of Saigon. General Post Office (Designed by Gustav Eiffel, the Post Office is a testament to the French presence in the late 1800s. The look and feel of this grand building is like an elegant railway station. You'll then be driven to visit the Reunification Palace. Then you’ll have approximately two hours to visit Binh Tay market (this is the main marketplace in China Town, where a great deal of wholesale trading occurs. Experience the commotion of this integral part of the city's daily business. Finish Cu Chi Tunnels - Saigon 1 Day Tour. Included: Transport in tour, breakfast, lunch, 01 Aquafina water bottle/pax, English speaking guide in tour, entrance fees and accommodation in Saigon. 07.30am: this morning we will pick you up from hotel and start to visit One Day Mekong Delta Tour (Cai Be - Vinh Long) around 3 hrs driving. On our dedicated car you can see the green paddy fields stretching towards the horizontal. 10.30am: Arrive in Cai Be, you’ll board a motorized boat that takes you to the and floating market spend time there for an interaction that you’ll see no where else in the world. When you feel it's enough for the serenity, let's get back to the large motor boat for something different in An Binh Island. It is well-known fresh fruits whole year. On the way, we have a chance to look the sightseeing 2 long sides river and find out the life of rural people in Mekong Delta. After lunch, we are divided into many groups and get on small row boats. During this 20 minutes trip, your boat will zigzag thru a maze of shadow canals to enjoy the fresh air along the canal and beautiful water coconut tree scenery. Then we will roaming through a village about 20 minutes to check out our natural landscape with quite and peace villages or we can relax on a hammock for a short rest in Mekong Delta. 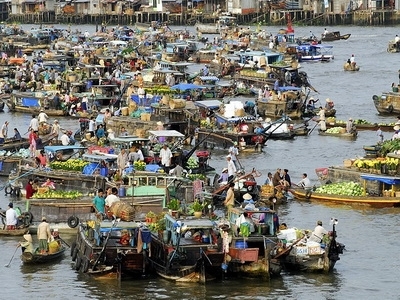 The next stop is Vinh Long City from An Binh Island (35 minutes by boat), we will land on a marketplace and walk around to see how and what the poor rural people of Vietnam sell in Vinh Long City. You are encouraged to interact with the vendors and see how friendly and respectful they are. You might also buy many interesting things for very little amount of money. The stop will be brief, ensuring that we come back to Sai Gon before 7.00 PM, finishing One Day Mekong Delta Tour (Cai Be - Vinh Long). Included: Transport, boat trips in Mekong delta have enough lifejacket for everyone, English speaking tour guide, breakfast, lunch, entrance fee, 01 Aquafina water bottle/pax and accommodation in Saigon. Excluded: Drinks, dinner, travel insurance, personal expenses and tip. Free time then our driver will transfer to airport and finish Vietnam Trip 7 Days 6 Nights. Included: Breakfast and airport transfer. Excluded: Lunch, dinner, guide, drinks, travel insurance, personal expenses and tip. Transport: Airport transfer, air con tourist bus, boat trips in Meking Delta have enough lifejacket for everyone. Transport transfers to water puppet show and dinner cruise. 06 breakfasts, 04 lunches and 01 dinner cruise. Transport: Airport transfer, private transport, private boat trips in Meking Delta have enough lifejacket for everyone. Ride elephant and water puppet ticket. If you request private transport, please choose "Private transport: Saigon - Dalat or Dalat - Saigon" parts. If your hotel's location is on these streets such as De Tham St, Bui Vien St, Pham Ngu Lao St, Le Lai St, Bui Thi Xuan St, Pham Hong Thai St, Thu Khoa Huan St, Nguyen An Ninh St, Cong Quynh St, Ly Tu Trong St…Dist 1, HCMC, Vietnam, we will free pick-up at your hotel (please provide your hotel address and the name of hotel where you will stay at). We free pick-up at hotel in the central area in Dalat.